29mm - 1/2 inch drive - 90mm in length - Oxygen sensor socket for GM. 22mm - 3/8 inch drive - 90mm in length - Oxygen sensor socket for Mitsubishi, Nissan, Opel, Vauxhall and VW. 27mm - 1/2 inch drive - 85mm in length - Injector socket for M24. 3/8 inch drive - 80mm in length - Vacuum switch socket. 3/8 inch drive - 74mm in length - Oil sender socket. 1/2 inch drive - 50mm in length - Heated oxygen sensor socket. 3/8 inch drive - 30mm in length - Offset oxygen sensor socket. The Teng Tools concept is based on each tool having its own place. 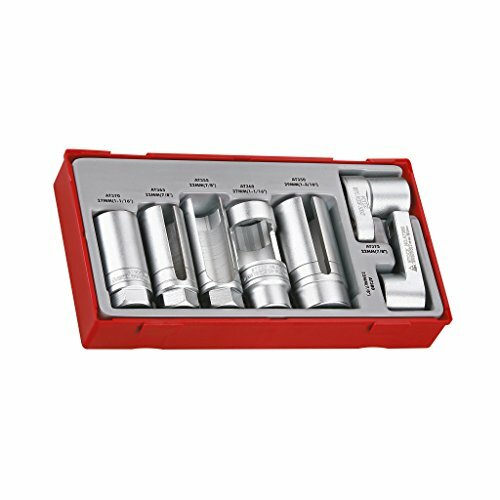 Each TT set acts as a part in an organised system by being clicked together with other TT sets and fits perfectly in your service case, tool box or roller cabinet. No space is wasted and each tool sits perfectly in place. This means it is much easier to see whether any tools are missing at the end of the day. 5 Steps to Get Organized . Choose storage: case/top box, middle box or roller cabinet. Choose the TT- sets you would like.. Take off the lid. Click the sets together. Place them in the storage!. If you have any questions about this product by Teng Tools, contact us by completing and submitting the form below. If you are looking for a specif part number, please include it with your message.